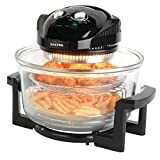 Marketed by the Thane Direct company, this is a conventional Halogen oven product, simple to use, normal thermostat and Timer with mechanical dial settings. Slightly smaller 11 Litre capacity than the others in the review and lower consumption. It is a 9.5kg weight in total, something to consider if you find it difficult to lift. Most of the other cookers in the review were 1400Watt, this one is stated to be 1300Watt and unexpectedly the temperature dial reads 150 deg to 250 degrees Centigrade, most of the others have a max of 200 degrees. The unit cooked well and all round it performed well on a range of foods. We found no problems with the sample which arrived on time, complete and undamaged.